In retreat to Sluiskil in the Netherlands. 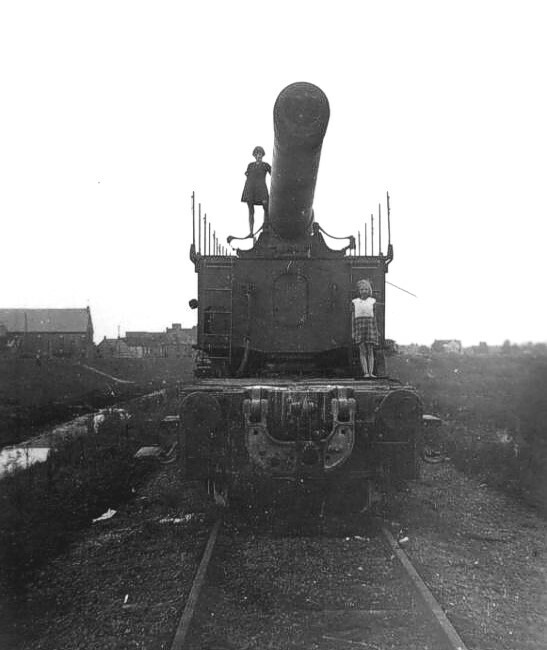 One of the K 5 guns that stranded in Sluiskil. In September 1944 the allies advanced along the French and Belgium coasts to the north. 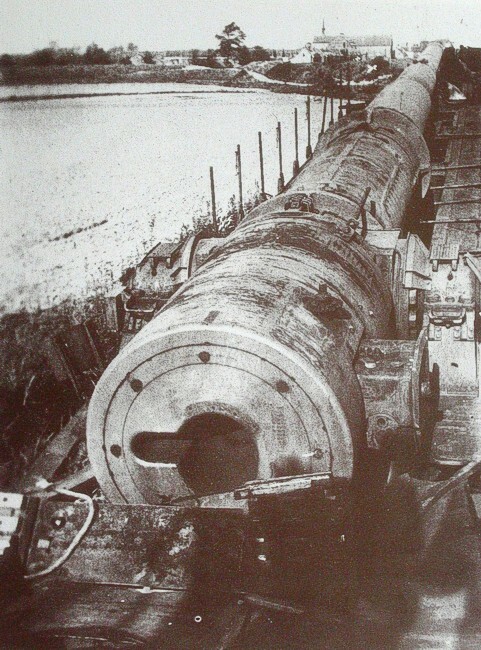 The German Command decided that the railway guns had to be moved to the area east of the river Rhine. So all batteries got their marching orders to fall back to the area Brugge-Gent. From there more instructions would be issued. We follow the E-batteries 701 from Marquise-Hydrequent, 710 out of Calais and 713 leaving Noirbernes and Fréthun. An other photograph of a K 5 before it was demolished. Almost all trains of these units passed Calais on 3 September at 15:00 hours. However one train of 713 (A) was here earlier. The next stop was Brugge. Here the order was given to go to Antwerp. Train 713 (A) heard at the station Gent that the station Termonde on the westbank of the river Scheldt was on fire. However the commander decided to follow the given plan. On arrival near Antwerp he found the bridge destroyed just before his eyes. He decided to blow up the train with one K 5. Keep in mind that in those days the allies were closing into Antwerp fast and that the harbour was more important than the guns. Two stranded and demolished K 5 guns at Sluiskil. The other trains arriving at Gent on September 4th were given a new route, that would follow the line Eeklo - Lokeren in order to reach Antwerp from the south. Due to the speedy allied advance this route was later that day not an option anymore. The last escape was Zeeuws-Vlaanderen in the Netherlands. So these trains were directed to Sluiskil. The two trains of 710 arrived at 22.00 hours. Shortly after that train 713 (B) with one K 5 jointed the waithing list. The next day train 701 (B) with the K 12 gun arrived. 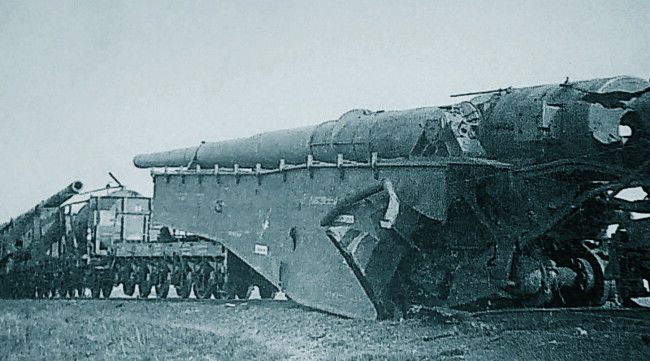 The destroyed K 12 gun of battery 701. The bridge over the canal here was already undermined and was turned in the open position. Permission the go across was not granted. The soldiers stole a boat in Terneuzen and went across the Scheldt to Goes. Lieutenant Schmiedel visited the trains op September 10th and gave the order to destroy the guns by using the ammunition on board. The other wagons were set on fire. One dieselloc (BR 311) was found undamaged and a Dutch scrapyard owner sold it in the nineteen sixties "back" to the Deutsche Bundesbahn for 160.000 Dutch guilders.